Not very long ago, India was seen as emerging hub of mobile handset production. With every large mobile manufacturer trying to setup base, India was the expected to be the next major hub for handset manufacturing after China. But, that looks like a distant dream now – According to a report released by Indian Cellular Association, the handset production in India has dropped alarmingly over last 2 years. 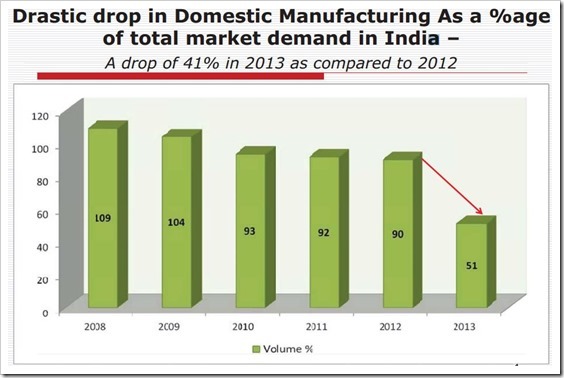 In 2012, India manufactured 180 million units; the same number fell to 125 million in 2013. Just to give you a perspective, till 2009, India manufactured more mobile handsets than it consumed. 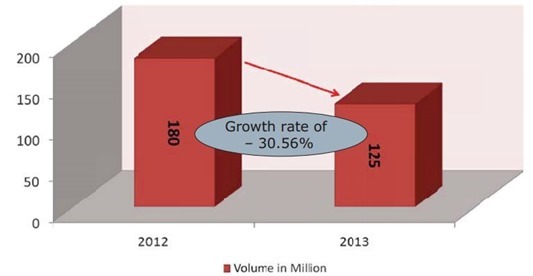 Even till 2012, the percentage of handsets produced in India as compared to market demand were in region of 90 percent. However, in 2013, it fell by a whopping 41 percent. So, on one side Indian consumers are buying more handsets than ever, but on the other side local supply has dwindled quite drastically. With production falling, exports of handsets have also taken a big hit. India had exported 110 million units in 2012 as against 45 million in 2013, a fall of over 59 percent compared to previous year. With consumer demand rising and local production falling, Indian mobile handset brands are importing more handsets than ever. According to Indian Cellular Association report, the imports are rising at a CAGR of 26.97 percent over last 6 years. In 2008, India was importing roughly 50 million handsets, the same number has risen to over 165 million by end of 2013. Its Simple! Mobile brands find it cheaper and easier to procure handsets from countries like China and Taiwan. 5-6 years back, companies like Nokia and Motorola has setup manufacturing units in India, and other brands had shown keen interest as well. However, lack of favourable policies and minimal export benefits and sops from Government discouraged manufacturers to increase handset production in India. Here is an interesting statistic, 3 in 10 mobile handsets in India are now manufactured out of China and this percentage is growing. One can safely say that India has missed a golden opportunity, because mobile devices business is going to keep growing in the foreseeable future. Linux Foundation Offers Its Rs. 1.5 Lakh Introductory Course For Free!